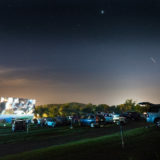 The nation’s only non-profit, community-owned drive-in theater is celebrating more than 65 years of movies under the stars in Rockbridge County. Call the Movie Line for detailed movie information: 540-463-2621 ... OR ... Text "Hulls" to 48421 to receive movie schedule and special offers.